Terby Crater was suggested as a possible landing site for the Mars Science Laboratory rover mission. It is a large crater blasted into the northern rim of the gargantuan Hellas Basin. Both of these holes in the crust of Mars were formed by impacts with asteroids or comets early in the planet’s geologic history. Large impacts excavate material from deep within the crust, allowing a rover to access rocks that otherwise would require a massive drilling rig. Since the interior of Mars is warm enough for liquid water, these rocks are of great interest in the search for possible ancient life on the Red Planet. As this HiRISE image shows, Terby Crater is interesting for additional reasons. The curving ridges most prominent near the center of the image look like stream channels. However, unlike normal channels, the interior is higher than the surroundings. One way features like this form on Earth is called “topographic inversion.” Stream beds can become lined with larger gravels or cobbles, making them quite resistant to erosion, so with time, the surroundings are removed and the originally low channel is left standing high (and dry). Another way similar features form is when a stream is flowing underneath a glacier. In this case the liquid water is confined by ice on either side and the sediments can build up. When the ice is removed, a ridge of these sediments is left behind. These are called “eskers” by geologists. 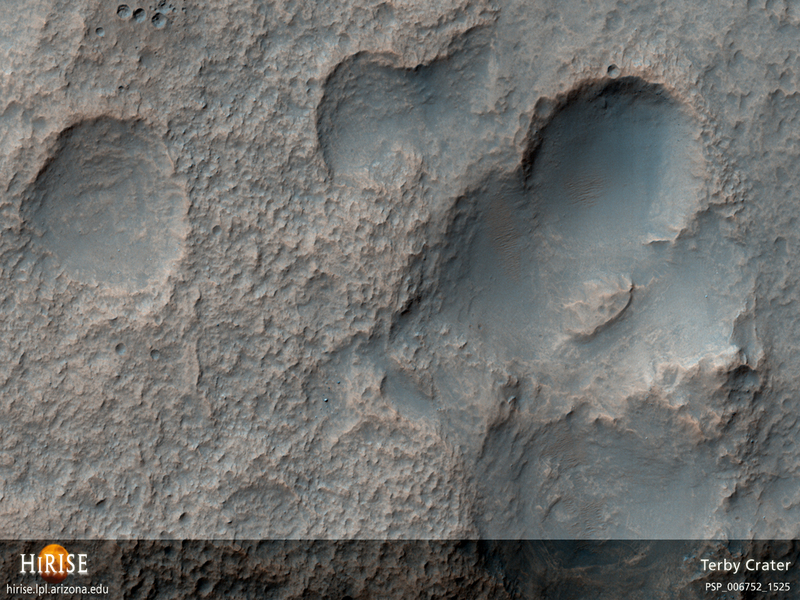 While further examination of this and similar HiRISE images may be able to distinguish between these possibilities, a rover would allow more detailed studies. This is a stereo pair with PSP_005618_1525.